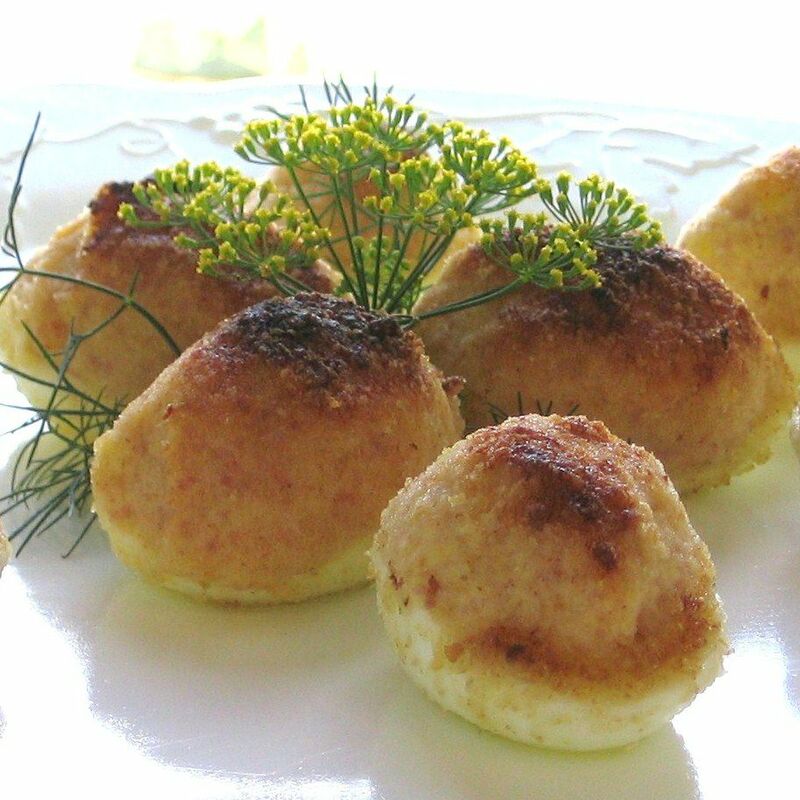 Polish stuffed eggs, or jajka faszerowany (YI-kah fah-sheh-rroh-VAH-nih), are also known as deviled eggs in the States. The filling is made with ham, cheese, sour cream, and mustard. What sets them apart is the broiled polonaise-style buttered bread crumb topping. This makes a great appetizer course or light lunch with a crisp salad and crusty bread. It is a popular offering at Easter brunch after Mass along with żurek wiełkanocny (Easter sour soup), kiełbasa światęczna (Easter sausage), and a groaning board of other delicacies. Remove yolks from egg halves and combine them with the rest of the ingredients, except the bread crumbs and melted butter. Mix well. Heat broiler. Mound the mixture into the egg whites, smoothing with a knife. Place on a heatproof dish or pan. Sprinkle with bread crumbs, covering the filling and whites completely, and drizzle with melted butter. Broil about 3 minutes or until breadcrumbs are crisp and golden. Serve warm or at room temperature. Refrigerate leftovers.